I went over to my movie-star neighbor's orchard Saturday, ostensibly to help him thin the fruits but actually just to peruse his ingenuity. The oldest tree in the orchard looks like it's about a decade old, and Frankie has grafted different varieties onto several branches. The photo above, for example, shows a limb that was cleft grafted maybe seven years ago. Here's the same limb from further afield. It's coated with tiny apples. Another limb of the same tree was grafted more like five years ago and is an interesting data point. 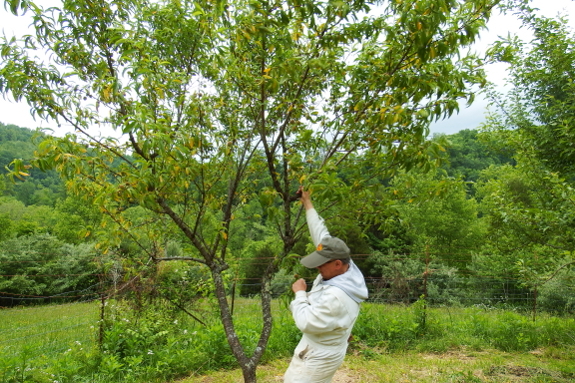 The parent of that particular scionwood is in the orchard nearby and barely has half a dozen baby apples on it...but the branch on the older tree is coated with a hefty crop of incipient fruits. In other words, the maturity of the tree accelerated production of that branch, something I've noticed in my own small experiments in that direction. So if you want to try out lots of varieties fast, the best option is to graft them onto branches of older trees rather than onto rootstock. 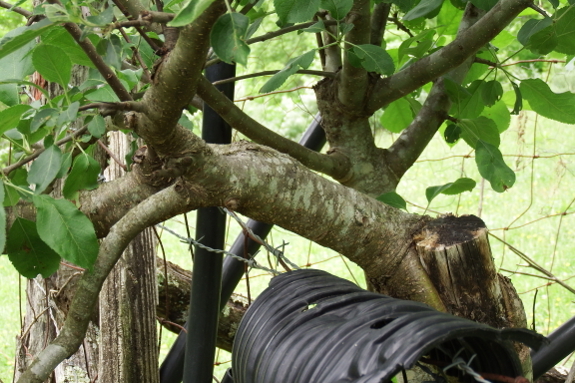 Finally, here's the best option we came up with for thinning those peach branches way above our heads --- give the tree a hard shake. Just don't look up!